CHILLICOTHE, OH (September 30, 2018) – Getting that first win on a national tour for most young guns usually takes a lot of time and frustration. Doing it again, however, is very different, let alone on the very next night. 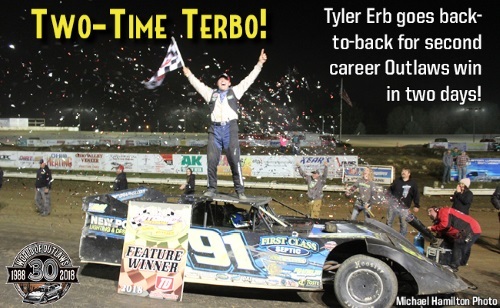 Most people would never have bet that “Terbo” Tyler Erb would sweep both nights of the Outlaw Invasion at Atomic Speedway before this weekend, and yet, he did, taking the race lead away from runner-up Mike Marlar on a last-lap pass for the win. “It means a lot to be able to be able to race with these guys like we do and finally have the results that I feel like we should have,” Erb said. The battle amongst the leaders really began to heat up around lap 20, when Erb moved into second around Mike Marlar and Chris Madden and appeared hot on then-leader Brandon Sheppard’s tail. He made the pass for the lead on lap 23 and held it across the stripe before Sheppard dove into turn one and snatched it right back. A yellow came out just a few laps later, settling Erb alongside Marlar. Erb gave Marlar the bottom lane for the restart, which proved to be the wrong decision, as Marlar took second back immediately and ran with the spot until the final lap. Sheppard made a costly mistake getting into turn one on lap 40, allowing both Marlar and Erb to sneak by on the inside. By this time, the leaders were in deep lapped traffic, which made things a little dicey for the last ten laps. Sheppard was able to battle back on the inside to reclaim the runner-up spot briefly, before Erb found the rocket boosters, blasting by Sheppard and charging after Marlar with less than five laps to go. Corner by corner, Erb closed the gap and saw his opportunity with the white flag in the air. He threw it very hard into turn one, riding the top edge of the track, and got a big blast off of turn two, pulling dead even under Marlar as they drag raced down the backstretch. Without making any contact, Erb dive-bombed into turn three and slid up in front of Marlar to secure the spot. Down the frontstretch he came once more, a winner yet again with the World of Outlaws. Erb started a little further ahead in the field than he did the night before; 13th instead of 17th. But the track conditions were much less aggressive than the previous night, which allowed drivers to maneuver the racing grooves a bit easier. This opened up more opportunities to make clean passes, which Erb took full advantage of, picking off 12 cars total and claiming Hard Charger honors in the process. Mike Marlar wrapped up his weekend with another top-five finish, this time in second, after the very exciting battle with Erb in the closing laps. Going down the backstretch on lap 50, Marlar and Erb were neck and neck. Marlar had a plan in case Erb tried to use the slidejob, but it came up just a bit short. Perhaps the most notable thing about the last-lap battle of Erb and Marlar was that there was no contact made at any point during the action, even when Erb completed the slidejob. Marlar went up to Erb in Victory Lane and gave him a gigantic bear hug as they celebrated a great race. It just speaks volumes about how fierce competitors can be on the track and great of friends they can be when the helmets come off. Brandon Sheppard once again found himself third on the podium at the end of the Sears Craftsman Feature. 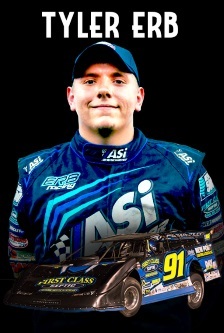 Not a bad outing for the Rocket Chassis number one, but Sheppard said he knew he had the car to beat on both nights. Ultimately, it came down to a very costly mistake on the topside of turns one and two. With just ten laps to go, Sheppard got a little too high entering turn one, throwing him up against the wall and over the top edge of the track. Marlar and Erb snuck by on the inside, and Sheppard was unable to earn the spots back. After the race was over, sixth-place finisher Chris Madden pulled up alongside Sheppard on the frontstretch and appeared to be having some sort of impromptu dispute of fault. This was reportedly due to some prior contact made between the two on the track over both nights of action at Atomic, culminating with some crew members and Series officials gathering together near the cars in the effort to sort things out. No violent acts ensued, but tempers definitely appeared to be boiling in the high heat of this points battle. Madden declined an opportunity for comment, but Sheppard said Madden was upset over his alleged rough driving earlier in the weekend. 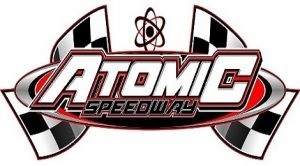 For full results from Atomic Speedway Night #2, Click Here. The World of Outlaws Craftsman® Late Model Series is brought to fans across the country by many important sponsors and partners, including: Arizona Sport Shirts (Official Apparel Company), Craftsman (Official Tool), Hoosier Racing Tire (Official Tire), iRacing (Official Online Racing Game), Morton Buildings (Official Building), Sears (Official Home Store), VP Racing Fuels (Official Racing Fuel) and DirtonDirt.com (Hard Charger Award); in addition to contingency sponsors, including: Cometic Gasket, COMP Cams, Edelbrock, JE Pistons, MSD, Penske Shocks, PFC Brakes (Fast Time Award), QA1, QuarterMaster, and Wrisco (Exclusive Racing Aluminum); along with manufacturer sponsors, including: Capital Race Cars, Integra Shocks, Impact Racing Products, Intercomp, Racing Electronics, Rocket Chassis and TNT Rescue. 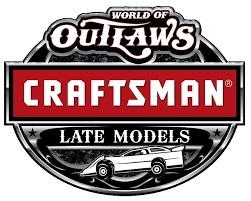 Founded in 1978, the World of Outlaws®, based in Concord, N.C., is the premier national touring series for dirt track racing in North America, featuring the most powerful cars on dirt, the World of Outlaws Craftsman Sprint Car Series and the World of Outlaws Craftsman Late Model Series. Annually, the two series race nearly 140 times at tracks across the United States and Canada. CBS Sports Network is the official broadcast partner of the World of Outlaws.DIRTVision® also broadcasts all World of Outlaws events over the Internet to fans around the world. 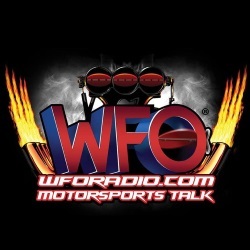 Learn more about the World of Outlaws.